Everyone knows the joy of curling up while on holiday with a good novel. But, Borgo Santo Pietro and some of the hotel's real life characters, can claim to feature in the actual pages of bestselling author, Titania Hardie's new novel. 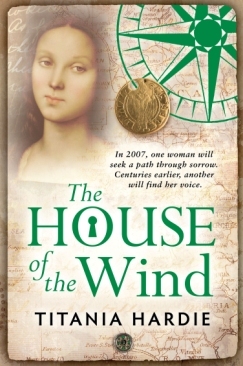 'The House of the Wind' follows the stories of two women born centuries apart. In 2007 Madeline Moretti who travels to Tuscany while still grieving for her fiancé who recently died. While there Maddie is captivated by the mystery of Casa al Vento, a ruined villa destroyed during a storm centuries before. In 1347 Mia lives with her aunt in silence after becoming mute following the death of her mother. One night a couple seek refuge in their villa and Mia is entranced by the young bride but is mystified by her reluctance to reveal even her name. Both Maddie and Mia are haunted by the woman who walked away unscathed from the ruins of the Casa al Vento - the House of the Wind. The Casa al Vento was inspired by Borge Santo Pietro. When researching the local area Hardie enjoyed her stay at the luxury hotel so much that it has been woven into the plot (even the owners' dog Eleanor makes a cameo appearance). I came looking only for a location to set the Tuscan end of the story and found instead the heart of the tale in the true paradise they have created out of ruins. In the acknowledgements of 'The House of the Wind' Hardie says, "Jeanette and Claus Thottrup generously opened their home and their lives for me. I came looking only for a location to set the Tuscan end of the story and found instead the heart of the tale in the true paradise they have created out of ruins. Your perpetual striving for excellence is a lesson." One look at the hotel and it is easy to see how it captivated Titania's imagination. Borgo Santo Pietro has a history of hospitality dating back to the 13th century when it would offer a refuge to pilgrims from across Europe on their way to Rome. The property was bought by Jeanette and Claus in 2001 when the main house in ruins and the 13 acres of ornamental gardens (with a further 20 acres beyond) were just muddy fields. The couple have beautifully restored the 11-bedroom hotel back to its former grandeur and opened it as a hotel in 2008. The hotel has eight individually decorated rooms in the main house, three garden cottages, an infinity swimming pool and the 800 year old former bake house has been converted into a spa. 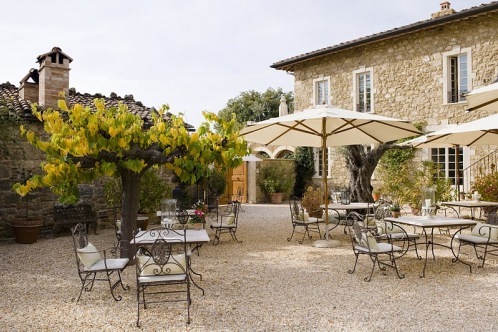 If readers of 'The House of the Wind' need any further encouragement to follow in Maddie's footsteps there is to be a competition at the end of the book offering the chance to win a two night stay at Borgo Santo Pietro. Born and educated in Sydney, Australia, Titania Hardie is the successful author of a range of non-fiction books. She has first class honours degrees in psychology and English, and was awarded the Chatterton bursary for post-graduate study at Bristol University, where she is completing her MA on the Romantic Poets. Titania lives in Somerset with her husband and two daughters. The House of the Wind is the follow up to Titania's bestselling fictional debut, The Rose Labyrinth.